After installation QuickPrinter icon appears in system tray. 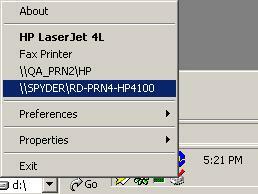 When you click it with your right mouse button, QuickPrinter shows the list of installed printers. To change current default printer, just point to a necessary printer and click with your left mouse button. That's all! Copyright © 2002-2003 Bizon Software.